Anderson was a versatile athlete at Stinnett, earning 12 letters in three sports. A punishing runner and middle linebacker, he led the Rattlers to playoff wins over Lefors (42-0), Farwell (33-0) and Plains (57-8) in his junior season before a 9-6 loss to Albany in the state semifinals. Anderson repeated his all-state honors as a senior, made the All-Southern and All-America teams and played in the 1961 Texas High School Coaches Association All-Star Game. 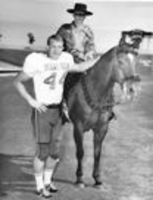 As a collegian at Texas Tech, the 6-2, 210-pound "Golden Palomino" was named All-SWC halfback three times (1963-65) and All-America twice (1964-65), and set the school record for career all-purpose yards (5,156). One of the NFL's original "bonus babies" after being drafted in the first round by Green Bay, he spent nine seasons with the Packers (1966-71) and St. Louis Cardinals (1972-74), ending his career with 4,696 rushing yards and 55 touchdowns. Anderson earned championship rings as the Packers won the first two Super Bowls, and has been inducted into the Green Bay Packer Hall of Fame (1983), the Texas Sports Hall of Fame (1984), and the College Football Hall of Fame (1989).